When we look at images or video or think of outer space scenery most of us imagine and sense of feeling of total void, of darkness, and most of all, of silence. But is this really the case? Although space is a virtual vacuum, this does not mean there is no sound in space. Sound does exist as electromagnetic vibrations. 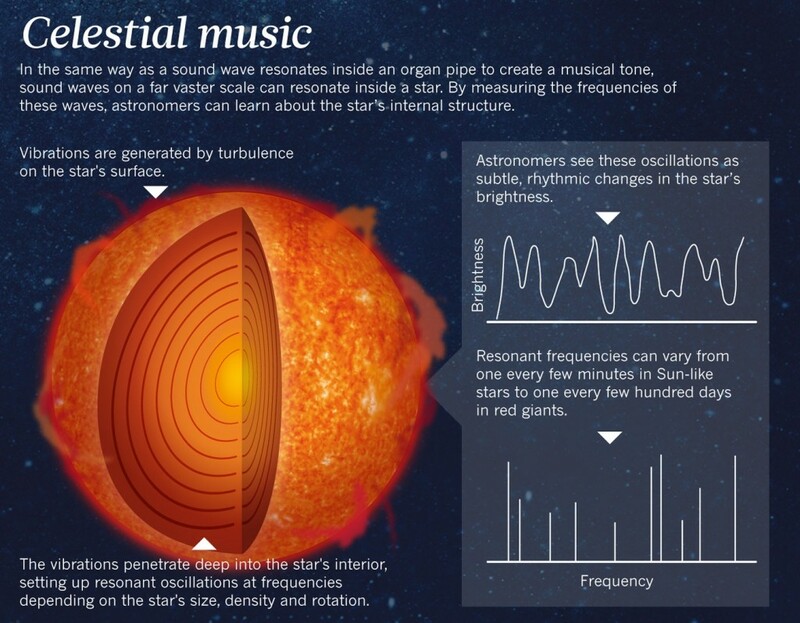 In the same way as sound wave resonates inside an organ pipe to create a musical tone, sound waves on a far vaster scale can resonate inside a star. By measuring the frequences of these waves, astronomers can learn about the star´s internal structure. Vibrations are generated by turbulance on the star´s surface. The vibrations penetrate deep into the star´s interior, setting up resonant oscillations at frequencies depending on the star´s size density and rotation. Atronomers see the oscillations as subtle, rythmic, rythmic changes in the star´s brightness. Resonant frequencies can vary from one every few minutes in Sun-like stars to one every few hundred days in red giants. But what about the planets in our solar system? Through specially designed instruments, the NASA Voyager, INJUN 1, ISEE 1, and HAWKEYE space probes used Plasma Wave antenna to record the vibrations all within the range of human hearing (20-20,000 Hz). The recorded sounds are the complex interaccions of charged electromagnetic particles from the Solar Wind, ionisphere, and planetary magnetosphere.